"Superb technicians and sensitive musicians ... an excellently played CD by two young and talented artists ..."
"In Bach's "Italian Concerto" old cliches are filled with fresh breath, in this way impulsively phrasing and flirting with tone ... In any skepticism regarding style and expression, the guitar is justified ..."
"The players "attack" the music with precision and sufficient dramatic flair to convey the squalling and tempestuous lyricism that Gershwin unravels at every turn ... Christodimou and Petridis hold the music together with strength and touches of delicacy when required ... Bach's "Italian Concerto" positively skips with effervescence. All three movements are arranged with imaginative and intelligent setting of the voices ..."
"Christodimou & Petridis, both awarded, with impecable technique, perform in an ideal way most of the works in the present recording ..."
"The two musicians relate in an harmonious way ... Piazzolla's "Tango Suite" and Rodrigo's "Tonadilla" are succesfully interpreted ... Not by any means are their transcriptions unjust to the prototypes. 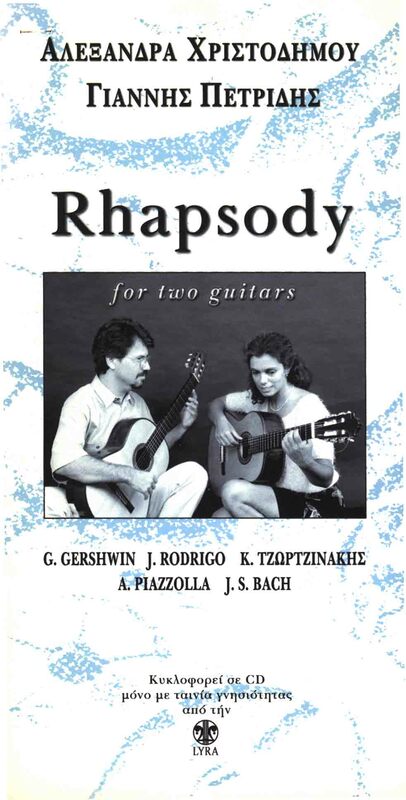 On the contrary, they follow, with the appropiate faith and respect as well as the freedom allowed, the original manuscript.Thus, their transcriptions are worth praise ..."
"When referring to the classical guitar sound lovers, this album is one of the best possible propositions. 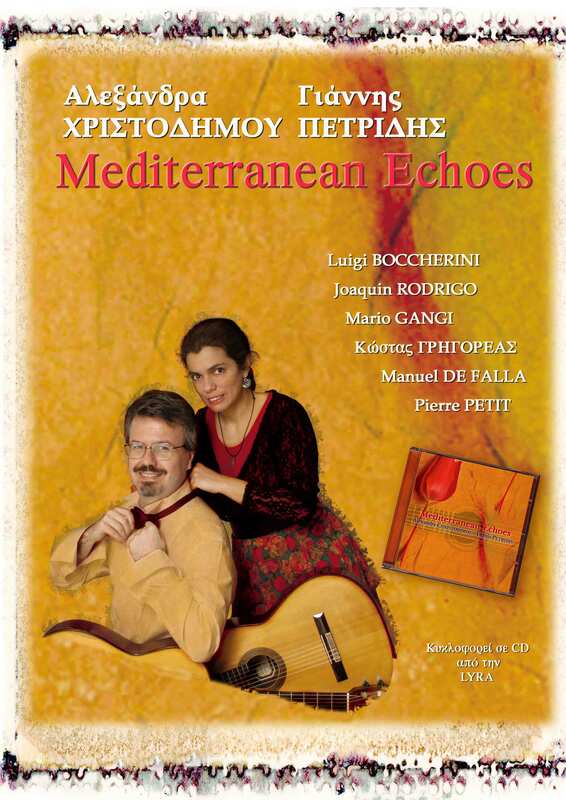 The two soloists -despite the young of their age- have already presented and recorded a significant part of their repertoire in Greece and abroad, gaining excellent reviews"
"Listening to it can be a complete delight. Light, joy, love, melancholy come out from the guitar's sound the chords of which vibrate in the two soloists' hands, at moments with intense rhythmical and dancing mood or with indolence and melancholy." "Especially in music like this, the two guitarists try to chat, flutter, and excite you ... I noticed something "minor" and "fleeting" details of the interpretations (because I always notice and I love them) that reveal the talent οf the two performers. "